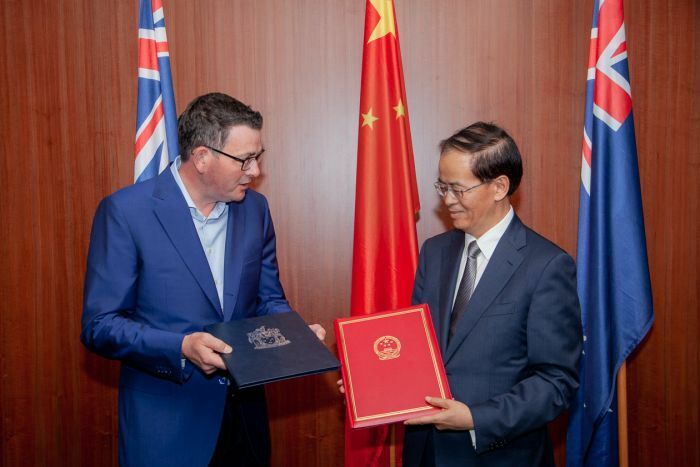 The Victorian government has released the agreement signed with China on the Maritime Silk Road (aka Belt and Road) on 8 October. One part of China's plan, not mentioned in the agreement, is expansion of Chinese education services to the region. Education is Victoria's major service export to the region. It is not clear if the Victorian Government envisages joint education initiatives under the Silk Road plan, or has worked through implications of competition from China's education providers. I will discuss some of the educational implications of the Silk Road at the 7th International Conference on Teaching, Assessment, and Learning for Engineering in Woolongong in early December. The Government of the State of referred to “the Victoria, Australia (hereinafter and the National Development and Reform Commission (NDRC) of the People’s Republic of China. Based on the aspiration of promoting the silkroad spirit centering on peace, cooperation, openness, inclusiveness, mutual learning and mutual benefits and aspiration to further enrich such spirit in keeping with the new era; welcoming and supporting China’s initiative to jointly promote the Silk Road Economic Belt and the 21st Century Maritime Silk Road Initiative (hereinafter referred to as the Belt and Road Initiative); willing to enhance practical cooperation within the framework of jointly building the Belt and Road, the Parties decide to work together to explore and form synergy in cooperation, enhance policy coordination, and further promote friendly cooperation. Recognizing that the NDRC is in charge of macroeconomic management and comprehensive economic management within the as Parties”) Government of China while the Government of the State of Victoria is dedicated to growth in knowledge intensive industries and services sectors, and the State of Victoria boasts strengths in infrastructure development, liveability, health, science and technology, and agriculture, thus providing opportunities for cooperation and partnership under the Belt and Road Initiative. I. The Parties will work together within the Belt and Road Initiative, with the aim of promoting connectivity of policy, infrastructure, trade, finance and people, so as to seek new opportunities in cooperation and inject new momentum to achieve common development; strive to develop an open global economy, jointly combat global challenges and promote the building of a common future. (ii) In accordance with the concept of cooperation, development and mutually beneficial progress under the Initiative of jointly building the Belt and Road, the Parties will enhance coordination and provide each other with support. (iii) The Parties will endeavor to carry out cooperation within their respective areas of responsibility and strengths as mutually agreed through bilateral communication. II. Innovate cooperation modes and platforms, encourage businesses, organizations and relevant agencies on both the Chinese side and the Victorian State side to play facilitating roles and foster long—term, stable, sustainable partnerships. III. Create enabling, growth-friendly policy environment for investment cooperation between the businesses on both sides. IV. Other cooperation that the Parties agree on. I. Through exchange of visits and existing cooperation mechanisms, the Parties will seek convergence between respective policies and planning. II. Focus the demands of bilateral cooperation, the Parties will carry out dialogues and exchanges, joint researches, pilot programs, knowledge sharing, capacity building, etc. III. The Parties will discuss cooperation with a third Party on jointly building the Belt and Road, and provide convenience to such cooperation. IV. The Parties may conclude agreements or other cooperation documents for cooperation in a specific field. V. Both on common Parties will review periodically the progress of cooperation under the Memorandum of Understanding through diverse forms of communication as necessity arises at various working levels, such as the exchanges of visits, video conferences, correspondence, etc. The Parties will settle differences in the or implementation of this MOU interpretation, application through friendly consultations. I. This MOU will enter into force from the date of signature. II. This MOU will remain in effect for five years and will be automatically extended for subsequent five year periods and so forth unless terminated either party by giving the other party a written at least three months in advance. III. This MOU may be amended by written consent of the two Participants and the amendment will be an integral part of this MOU. IV. To terminate this MOU one party should give the other party a written notice through diplomatic channels at least three months in advance. This notice will be terminated after joint agreement. The termination of this MOU will not influence executing programs which will continue according to the agreement timetable until completion of programs. V. This MOU does not create legal relations or constitute a legally binding contractual agreement between the parties. Signed in duplicate on 8th, October, 2018, in the Chinese and English languages, both texts having equal validity. Chairman, the National Development and Reform Commission of the People's Republic of China.